Offering you a complete choice of products which include heavy duty carton sealer and random carton sealer. We are one of the leading import of efficient and durable Heavy Duty Carton Sealer. The offered range finds a vast usage of domestic electrical appliances, chemical industry, food stuff and general merchandising. 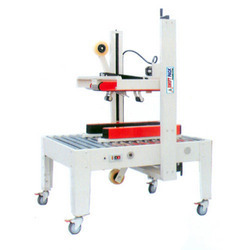 Provided in several models to cater to the varied customer's needs, these carton sealers are tested on several parameters before handing over to the clients. Our Random Carton Sealer is extremely durable, has low energy consumption, and its packaging speed is very good. Various tapes that are compatible with this model are BOPP, water free adhesive tape, and PVC adhesive tape. Depending on the size of cartons, the height and width can be adjusted. We have a perfect amalgam of ultra modern machinery and highly competent workforce, being strengthened to manufacture world class sealing equipment.